ASU senior guard Kodi Justice (44) drives towards the basket during the second half of the Sun Devils' 88-79 victory over the UCLA Bruins on Saturday, Feb. 10, 2018 at Wells Fargo Arena in Tempe, Arizona. 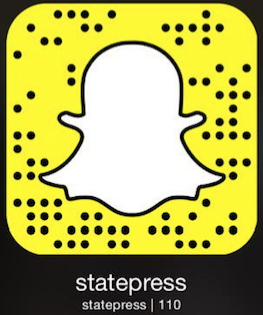 The State Press analyzes ASU men's basketball win over UCLA from The State Press on Vimeo. State Press reporter Anthony Totri breaks down the ASU men's basketball team's win against UCLA. Totri discusses the strong offensive performance, containing Aaron Holiday and Bobby Hurley's first weekend sweep in conference play. Sweep LA, sweep LA, sweep LA! I'm inside the Wells Fargo Arena where Sun Devil fans were just witnessing ASU's 88-79 victory over the UCLA Bruins and it was all thanks to senior guards Kodi Justice, Tra Holder and Shannon Evans. The three contributed 62 of ASU's 88 points tonight and they had their way with the Bruin defense. From three point land, to the charity stripe and inside the paint. But, guys like Kimani Lawrence and De'Quon Lake, those two put up solid performances the entire night. De'Quon had some great inside defensive play and Kimani Lawrence he had his best scoring game all season long tonight. Now, it might have gone a different way if ASU wasn't able to stop Aaron Holiday like they did tonight. They held him to three points at halftime and Bobby Hurley in the press conference after the game said they specifically game planned to give him fits and it showed as the entire UCLA defense that typically runs through Holiday had no answers for ASU. Now this is Bobby Hurley's first sweep in a weekend series in conference play, but ASU is now looking forward to the Territorial Cup on Thursday against the U of A Wildcats. Until then, I'm Anthony Totri reporting.